Hewlett-Packard leads the installed base for New Vista Primary Home PCs while Dell leads the installed base in New XP Primary Home PCs. 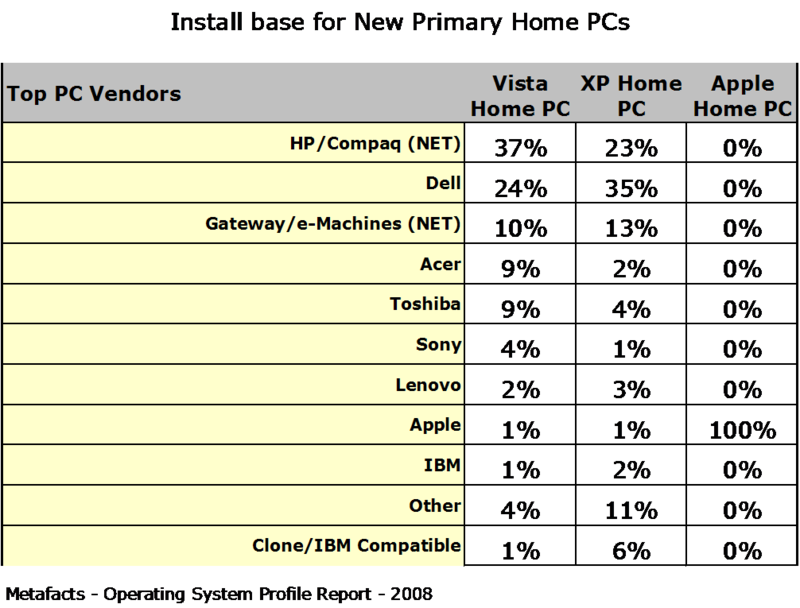 Four in ten New Vista Primary Home PCs purchased are Hewlett-Packard (37%) while one out of four is Dell (24%). One-third of New XP Primary Home PCs purchased are Dell (35%) while a quarter are Hewlett-Packard (23%). MetaFacts releases ongoing research on the market shifts and profiles for Windows Vista, Mobile PCs, Workplace PCs, Home PCs, Broadband, Digital Imaging, and many other technology industry topics. These Profile Reports are in a series on specific topics utilizing the Technology User Profile Annual Edition study, which reveals the changing patterns of technology adoption and use in American households and businesses. Interested technology professionals can sign up at www.metafacts.com for complimentary TUPdates, periodic snapshots of technology markets.